Alabama, the Yellowhammer State or The Heart of Dixie (both unofficial nicknames), ranks 30th in total land area and 23rd in population with almost 4.6 million residents in 2006. Residents of Alabama are referred to as Alabamans. While many think "Sweet Home Alabama" is the state song, the official state song of Alabama is called Alabama and starts: "Alabama, Alabama, We will aye be true to thee,/ From thy Southern shores where groweth." Alabama is abbreviated AL and its state capital is Montgomery. Birmingham is the largest city. The oldest city is Mobile. The Gulf of Mexico is the only bordering body of water. Alabama's major industry is agriculture (cotton, corn, peanuts, soybeans, poultry, and livestock). Alabama borders the states of Tennessee, Mississippi, Georgia and Florida. The state bird of Alabama is the Yellowhammer and the state tree is the Southern Longleaf Pine. Want to know about preparing for the Alabama Reading and Mathematics (ARMT) standardized test ? Are you interested in information on Homeschooling in Alabama or a Alabama homeschool parent support group? The Time4Learning online learning system combines interactive lessons, multimedia reinforcement activities, printable worksheets, learning games, and assessments with reports into one Homeschool Curriculum. 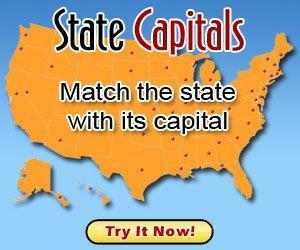 Find more Alabama games here!